On Sunday night once home from work I often don’t have any advance plans for dinner. I’ve always bought too much from stallholders over the weekend so I know I can quickly put something easy together. 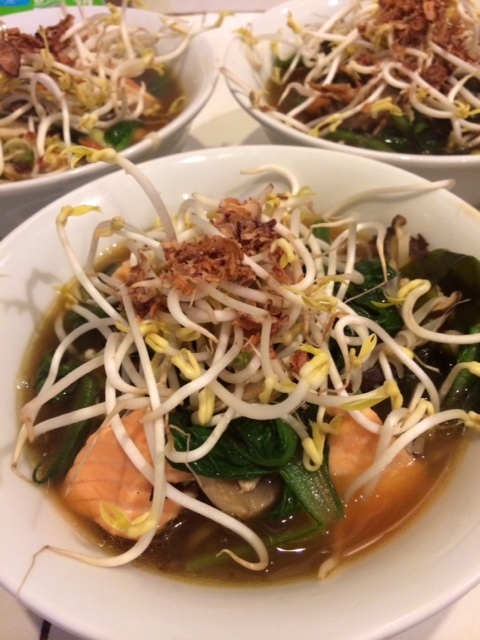 Last weekend I bought several varieties of mushrooms and sprouts from Jason, a selection of leafy greens from Fresh Gardens, both chicken and beef broth from Kate of Best Bones Broth and large piece of fresh salmon from Nicole of Mt Eden Fish Shop (inside beside our Kitchen Shop). This soup is the result. I gave it a bit of a Japanese feeling with the additional of dashi and soy sauce to the stock but you could add Thai fish sauce and soy instead. Be as imaginative as you like with this soup with any selection of mushrooms and green vegetables. It doesn’t matter about being exact with quantities. Heat the chicken stock in a large pot and stir in the dashi and a splash of sake. Add the mushrooms then after a minute or two add the salmon cubes and prawns if you’re using. Cook for another minute. Next add the greens, spring onions and cooked noodles. It’s now ready. Taste and adjust the seasoning with soy sauce and pepper.